With version Yosemite, OSX no longer bundles Java 1.6. Because of that, we have to tell IntelliJ to use the Java 1.8 (or newer) runtime instead. The best way to do this is to put a file "idea.properties" into the directory ~/Library/Preferences/IntelliJXX/, specifying the correct runtime. You can also specify other properties like console buffer size and so forth. Your properties file could look like this: idea.properties . It's also ok to just use this file. Enter the name of your plugin for "Module Name"
Change the entry of "Content root" using the "..." button, create new subfolder within the parent module named according to your plugin name, select this folder for "Content root" and "Module file location"
Download the attached code_styles.jar and import them with File -> Import settings. The provided copyright.txt is for the denkbares GmbH, but can easily be changed to other firms or e.g. the university. Go to File -> Settings -> Version control -> Confirmation -> When files are created. You're probably looking for "Add silently". Use View -> Quick Documentation or the corresponding keyboard shortcut (depends on OS and Keymap). On Mac OSX with Eclipse keymap, F2 Works. It's also possible to enable automatic JavaDoc popup on code completion in Preferences -> Editor -> Code completion (Autopopup documentation). Open Menu Run->Edit configuration and there go to Defaults->JUnit->Working directory and set the value to $MODULE_DIR$. After that IntelliJ IDEA will set the relative path in all JUnits just like Maven. 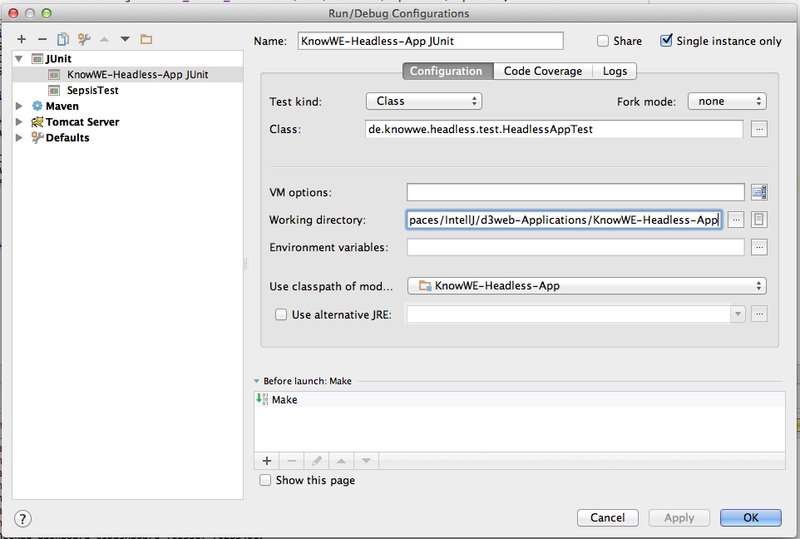 To run the Headless-App-Tests in JUnit (e.g. 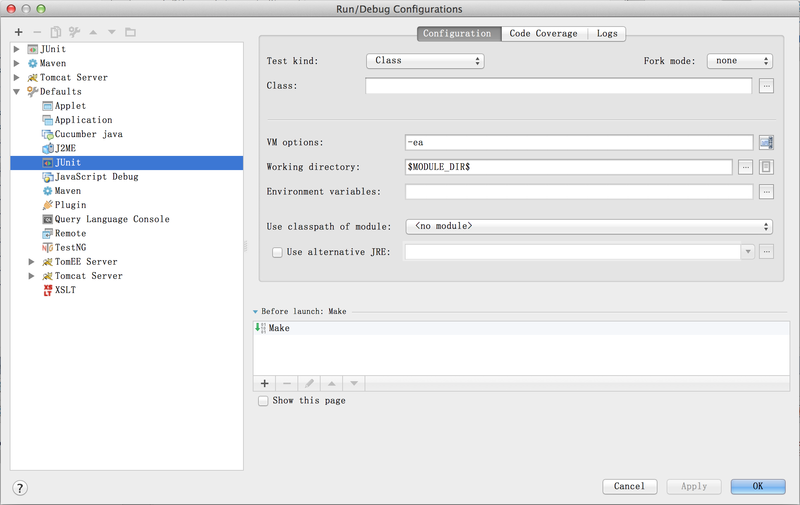 for debugging), create/add a new JUnit Configuration. In the configuration, make sure to use the settings displayed below. Make sure you select the Working directory of the "KnowWE-Headless-App", and select the classpath of the module "KnowWE-Headless-App". "Test kind" has to be "Class" and "Fork mode" has to be "none", otherwise debugging is not possible. The above order will not quite avoid all changes, since Eclipse seems to additionally add blank lines between all imports with different first path elements, but this seems close enough for now. I think since it is a code style, this should also be part of the code style settings, which are also attached to this site. Open “Project Structure” dialog and choose “Global Libraries”. Specify your library name in the “Name” field. Attention: After adding files to your library, they become read-only in IntelliJ. You should only add files as global libraries that you will not change often. Otherwise you need to removed them from the library as long as you edit them or only use an external copy of the files. In eclipse it was possible to delete the work-folder in KnowWE-App, but in IntelliJ that does no longer work. For developers migrating from Eclipse to IntelliJ, the default behavior of breakpoints in IntelliJ might be unexpected. While Eclipse only suspends the thread that reached the breakpoint, IntelliJ also suspends all other threads when a breakpoint is reached. This behavior can simply be changed in the settings of the breakpoint: Open the breakpoints panel in the debugger an navigate to your breakpoint. Right to the checkbox "Suspend" select the radio-button "Thread" instead of "All". On the right side of the panel you can also make this setting the default. IntelliJ does not have a view showing all current compile errors like Eclipse did, because it does not compile automatically on each change of the code. In the settings, search for "Java Compiler" and select "Eclipse" as compiler. You now see the errors and warnings in the Messages view and can go through them. You can hide warnings with a button in the tool bar of the view. Alternatively, select scope "Problems" in the Project view. Unfortunately this does not show all existing compile errors, but only the ones of the files you have already viewed. There currently seems to be a problem with the eclipse compiler option using Java 8. If you are getting an error like "Error:java: source level should be comprised in between '1.3' and '1.7' (or '5', '5.0', ..., '7' or '7.0'): 8", switch back to Javac again. To remove the dock entries that IntelliJ spawns when compiling or running Tomcat, append -Dapple.awt.UIElement=true to your Java VM options. Install JDK 8 and add and set it as the default in your JDK. In IntelliJ, go to File -> Project Structure... -> SDKs and add the JDK 8. Under Project also in Project Structure..., set it as the default. Download the current Tomcat 8 as the zip version. Unzip it analogous to your Tomcat 6 and set it your Tomcat configurations in IntelliJ. jspwiki.properties is now jspwiki-custom.properties. Instead of in local/WEB-INF/ it is now in local/WEB-INF/classes/. It has basically the same content as before, but you should nevertheless start again from the .default file and just migrate your individual settings like var.basedir to the new file. "Error:java: source level should be comprised in between '1.3' and '1.7' (or '5', '5.0', ..., '7' or '7.0'): 8"
"Failed to start managers: File /IntelliJ%20Workspaces/denkbares/KnowWE-App/target/KnowWE-App-0.2-SNAPSHOT/WEB-INF/jspwiki.policy does not exist, or the SecurityManager prohibited access to it." your problem is very likely a whitespace in the path to the jspwiki.policy file. The SecurityManager of JSPWiki 2.10 does not like that. If the whitespace is in your workspace folder name, you can close IntelliJ, rename the folder, open IntelliJ again and then choose the new folder in the welcome splash screen after clicking "Open Project". You are trying to start KnowWE with an old pre 2.9 JSPWiki plugin like the TablePlugin. Update or remove these plugins in your dependencies. There are leftover files in your workspace containing the old JSPWiki code with the wrong package names. Do a "Find in path" with "ecyrd" to quickly find them. Most likely you can delete or update them. In case the files are in one of the "Overlay" folders in KnowWE-Resources or KnowWE-App, you can delete them. Do a maven build afterwards.